I have two cloned repositories of two very similar open-source projects, which I have been working on in different instances in Sublime Text 2 to arrive at my desired result. Code from both of these projects was used. I have been using Git as version control for my project, but have not included the original projects. Thus, I would like to be able to quickly compare the contents of two files of the original project and compare the differences between them and my project. I was hoping that Sublime Text 2 would have a "Compare File" feature, but I can't seem to find anything related to it in the settings or online. A third-party ST2 package to accomplish this task would also work well. Is such a task possible to do within the ST2 text editor? You can actually compare files natively right in Sublime Text. Right click and select the Diff files... option. UPD: I need to add that this plugin can freeze ST while comparing big files. It is certainly not the best decision if you are going to compare large texts. There are a number of diff plugins available via Package Control. I've used Sublimerge Pro, which worked well enough, but it's a commercial product (with an unlimited trial period) and closed-source, so you can't tweak it if you want to change something, or just look at its internals. FileDiffs is quite popular, judging by the number of installs, so you might want to try that one out. Use this FOLDERS-titled Side Bar to navigate to the first file you want to compare. Select it (click on it), hold down ctrl and select the second file. There should be a new Tab now showing the comparison. The "Diff files" only appears with the "folders" sidebar (to open a folder: File->Open Folder) , not with "open files" sidebar. I'm using Sublime Text 3 (build 3143) on Mac and have been trying for about 30 minutes to find this File Compare feature. I had used it before on Sublime/Mac without any problems, but this time, it was trickier. But, I finally figured it out. The file format does not need to be UTF-8. I have successfully compared files that are UTF-8, ISO-8559-1, and Windows-1252. There is no File > Open Folders on Sublime/Mac. Many instructions above start with "Select File > Open Folders," but that doesn't exist on Sublime/Mac. File compare works on a Project basis. If you want to compare two files, they must be saved to disk and part of the current project. If Sublime/Mac is not running or if it's running but no windows are open, drag a folder onto the Sublime app. If Sublime/Mac is running, select "File > Open", navigate to the desired folder, don't select a file or folder and click "Open". Add a folder to a project. If the files you want to compare are not part of the same hierarchy, first open the folder containing one of the files. Then, select "Project > Add Folder to Project", navigate to the folder you want and click "Open". You will now see two root-level folders in your sidebar. The Sidebar must be visible. You can either "View > Side Bar > Show Side Bar" or use the shortcut, Command-K, Command-B. Files must be closed (ie, saved) to compare. Single-clicking a file in the Side Bar does not open the file, but it does display it. You can tell if a file is open if it's listed in the "Open Files" section at the top of the Side Bar. Double-clicking a file or making a modification to a file will automatically change a file's status to "Open". In this case, be sure to close it before trying to compare. Select files from the folder hierarchy. Standard Mac shorcut here, (single) click the first file, then Command-click the second file. When you select the first file, you'll see its contents, but it's not open. Then, when you Command-click the second file, you'll see its contents, but again, neither are open. You'll notice only one tab in the editing panel. Control-click is not the same as right-click. This was the one that got me. I use my trackpad and often resort to Control-click as a right-click or secondary-click. This does not work for me. However, since I configured my trackpad in System Preferences to use the bottom-right corner of my trackpad as a right-click, that worked, displaying the contextual menu, with "Delete", "Reveal in Finder", and.... "Diff Files..."
Voilà! I hope this helps someone. This opens a new tab showing the comparison. The first file in red, the second in green. This is for side by side comparison. For actual diff, there is the diff function other already mentioned. Unfortunately, I can't find a way to make columns scroll at the same time, which would be a nice feature. No one is talking about Linux but all above answers will work. Just use Ctrl to select more than one file. If you are looking to compare side by side, Meld is lovely. There's a BeyondCompare plugin as well. It opens the 2 files in a BeyondCompare window. Pretty convenient to open files from the sublime window. You will need BC3 installation present in the system. After installing the plugin, you will have to provide the path to the installation. Not the answer you're looking for? Browse other questions tagged compare sublimetext2 diff sublimetext sublime-text-plugin or ask your own question. 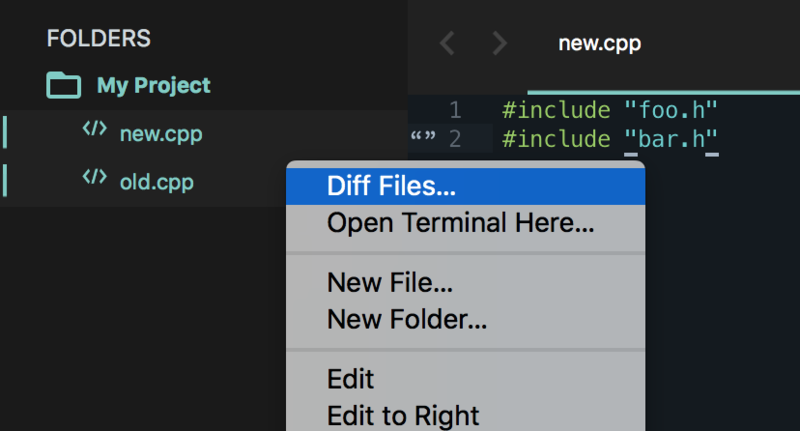 Why is it not possible to diff 2 files in sublime text 3103 on mac anymore?